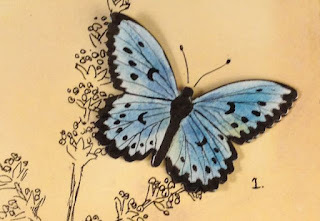 I have been expanding my crafting repertoire by entering some online challenges (a total of 6, I think – three 12 Tags of 2016, one Steampunk Challenge, one Creative Carte Blanche and one Simon Says Stamp Challenge) so I would stretch my artistic wings. Often the deadline passes long before I have an idea I want to act on. But sometimes, the idea is in my mind almost immediately after reading the challenge. 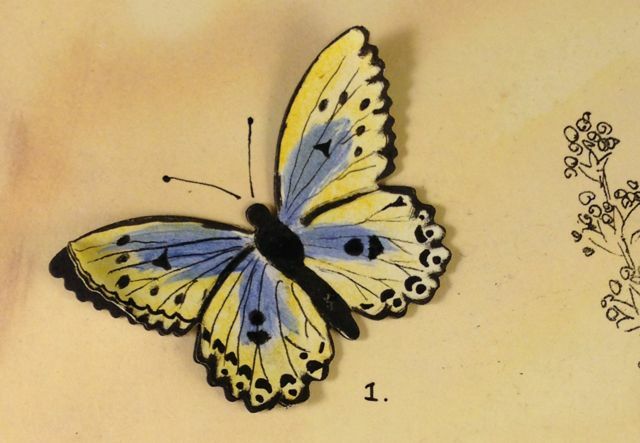 So this week’s Simon Says Stamp Monday challenge is “Butterfly Beauty” as in use a butterfly in your crafty piece. I immediately thought that I would do a house with butterflies on the roof like the way Monarch butterflies cluster together. It took a day for me to decide that I really couldn’t execute it the way I envisioned it. So idea no. 2 came pretty quickly, how about a vintage butterfly print? So I found a vintage print online that I would use as inspiration. 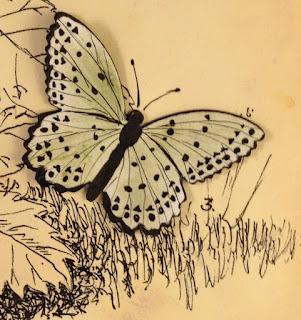 I drew the plant in the background, put it in the copier and copied it to cream colored card stock, antiqued the card stock with various Tim Holtz Distress inks – vintage photo being the main one. 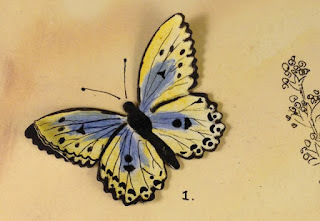 I used a Martha Stewart butterfly punch for the butterflies and colored with them with various inks and pens and crayons and then glued them to a black card stock butterfly for a little more dimension. 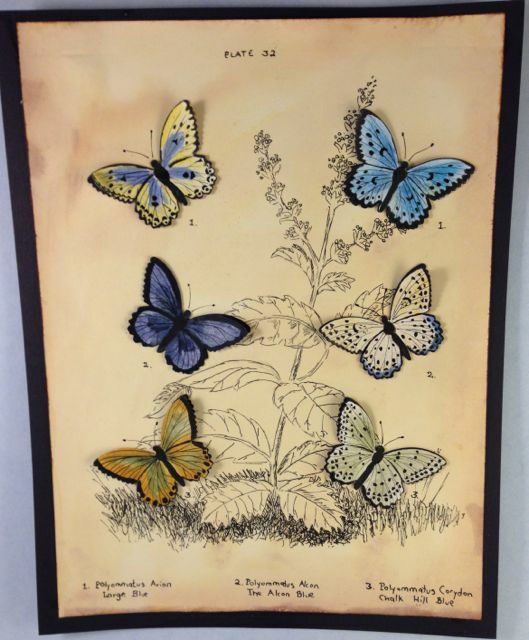 I glued them to the antique botanical background and then drew the antennae and the description for plate 32 – Polyommatus Arion, Polyommatus Alcon and Polyommatus Corydon. 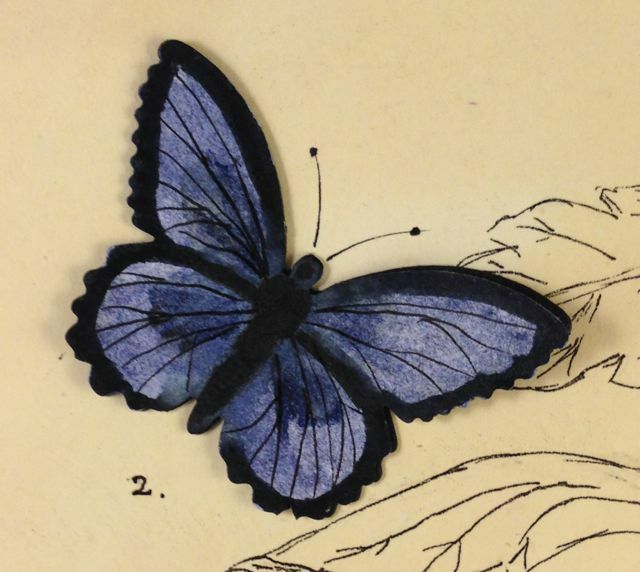 Probably not anatomically accurate, but the coloring is pretty close to the print. I am really happy about this design. On to the next challenge – loading it up correctly. Last time I tried to add my entry to the Simon Says Stamp blog, I messed it up. But I have been studying the directions and I think I can do it right this time. Addendum – I think I did it! 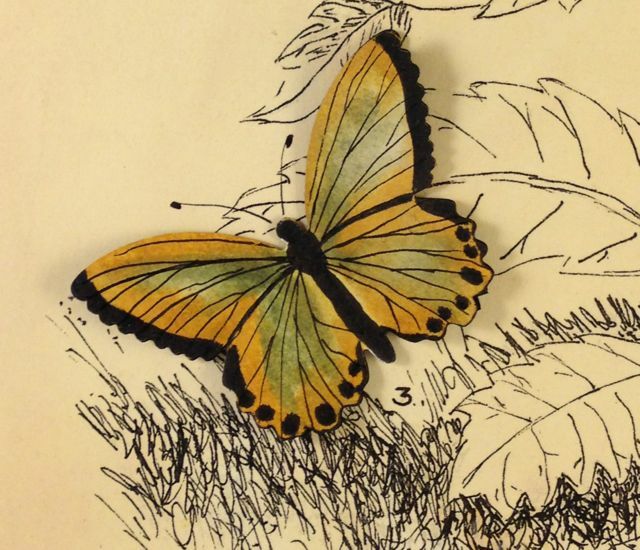 You can see the Butterfly Beauty Challenge here. Thanks for the recent visit! Glad to visit you as well, because these butterflies are beautiful!!! I LOVE the background paper as well! Thanks for sharing this lovely artwork. 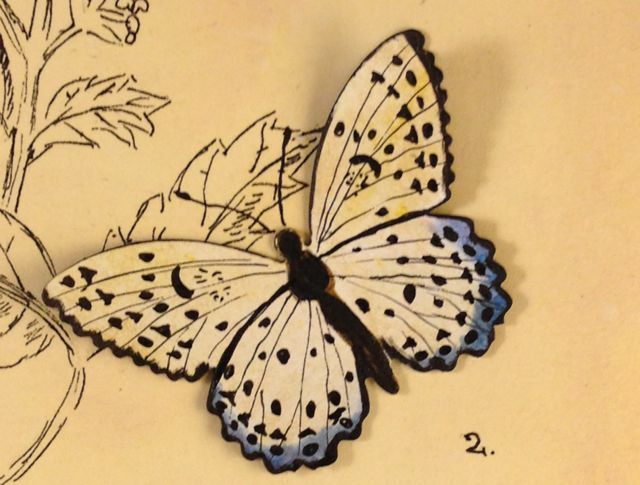 I see you used the Martha Stewart punch but the butterfly stamps or images are not mentioned. Are they stamps? Please let me know. I searched on butterflies and it was an image that I really liked.